Aortic regurgitation (AR) and subclinical left ventricular (LV) dysfunction expressed by myocardial deformation imaging are common in patients with transposition of the great arteries after the arterial switch operation (ASO). Echocardiographic evaluation is often hampered by reduced acoustic window settings. Cardiovascular magnetic resonance (CMR) imaging provides a robust alternative as it allows for comprehensive assessment of degree of AR and LV function. The purpose of this study is to validate CMR based 4-dimensional flow quantification (4D flow) for degree of AR and feature tracking strain measurements for LV deformation assessment in ASO patients. A total of 81 ASO patients (median 20.6 years, IQR 13.5–28.4) underwent CMR for 4D and 2D flow analysis. CMR global longitudinal strain (GLS) feature tracking was compared to echocardiographic (echo) speckle tracking. Agreements between and within tests were expressed as intra-class correlation coefficients (ICC). Eleven ASO patients (13.6%) showed AR > 5% by 4D flow, with good correlation to 2D flow assessment (ICC = 0.85). 4D flow stroke volume of the aortic valve demonstrated good agreement to 2D stroke volume over the mitral valve (internal validation, ICC = 0.85) and multi-slice planimetric LV stroke volume (external validation, ICC = 0.95). 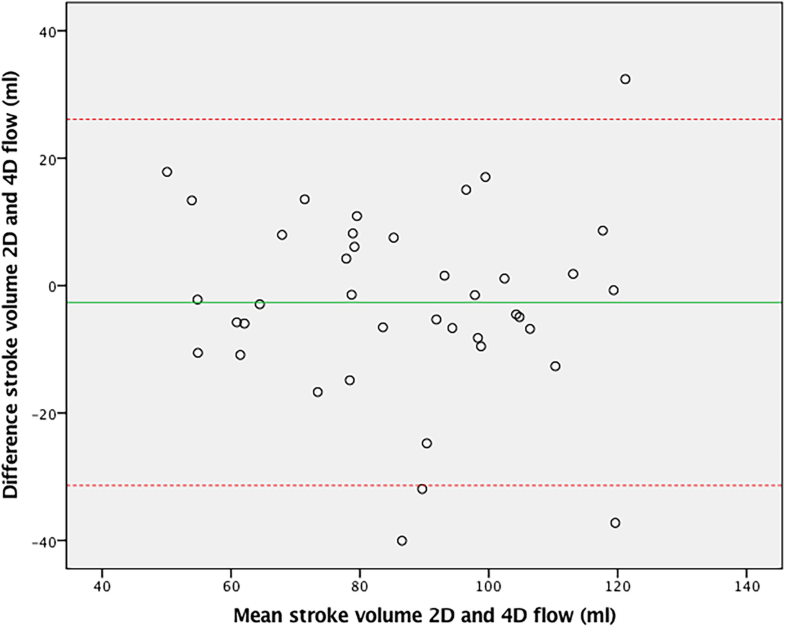 2D flow stroke volume showed slightly less, though still good agreement with 4D flow (ICC = 0.78) and planimetric LV stroke volume (ICC = 0.87). GLS by CMR was normal (− 18.8 ± 4.4%) and demonstrated good agreement with GLS and segmental analysis by echocardiographic speckle tracking (GLS = − 17.3 ± 3.1%, ICC of 0.80). Aortic 4D flow and CMR feature tracking GLS analysis demonstrate good to excellent agreement with 2D flow assessment and echocardiographic speckle tracking, respectively, and can therefore reliably be used for an integrated and comprehensive CMR analysis of aortic valve competence and LV deformation analysis in ASO patients. The arterial switch operation (ASO) with the Lecompte technique is the first-choice surgical technique for correction of transposition of the great arteries (TGA) [1, 2]. Despite overall good clinical outcome, aortic regurgitation (AR) is a common finding and a minority of patients requires aortic valve (AV) and/or aortic root reconstruction [3–5]. Also, subclinical cardiac dysfunction expressed by reduced global longitudinal strain (GLS) has been described, which may precede future systolic dysfunction [6, 7]. Therefore, strict follow-up of ASO patients continuous to be warranted for aortic and ventricular function. The changed geometrics of the outflow tracts after ASO  make it difficult to visualise all aspects of the heart and to quantify degree of AR with routine echocardiography. Therefore, additional advanced cardiac imaging is recommended by the latest guidelines [5, 9]. Cardiovascular magnetic resonance imaging (CMR) has developed rapidly over the past decades. Newly available CMR techniques include whole heart 4-dimensional flow quantification (4D flow) for AV assessment and feature tracking for left ventricular (LV) strain analysis [10, 11]. In theory, transvalvular 4D flow with annular tracking provides more accurate assessment of eccentric regurgitation jets and improved correlation between flow volumes when compared to conventional 2-dimensional CMR measurements because of correction for valvular through-plane motion and flow angulation . In addition, feature tracking by CMR has proven a robust measure of cardiac deformation, providing a valid alternative for echocardiographic speckle tracking [11, 13]. With the recent availability of semi-automatic analysis tools, these measurements become a clinically relevant alternative to echocardiography for ASO patients with a limited acoustic window. Since eccentric AR jets are often present after ASO, we hypothesised that 4D flow CMR is more accurate than 2D flow assessment to quantify degree of AR in ASO. Furthermore, we hypothesised that CMR feature tracking is a fast and accurate tool to quantify myocardial deformation in this patient cohort. Accordingly, the purpose of this study was to validate 4D flow assessment of the AV and CMR feature tracking for LV strain analysis, with comparison to 2D flow CMR and echocardiographic speckle tracking, respectively, as part of a comprehensive CMR evaluation protocol of ASO patients. A prospective cross-sectional cohort study was performed between August 2011 and January 2015. Patients eligible for inclusion had underwent an ASO in our center and were older than 12 years of age. Patients with pacemaker, claustrophobia or signs of ischemia during exercise test were excluded. Patients were examined by CMR and echocardiography within 1 week. The local medical ethics committee approved this study. Informed consent was obtained from all patients and additional consent by parents if aged under 16 years. Patient characteristics were obtained from the patient charts. Patients were scanned according to a predefined imaging protocol with gadolinium contrast, without anaesthesia or sedation on a 1.5-T CMR system (Ingenia R4.1.2, Philips Healthcare, Best, The Netherlands). Routine balanced steady-state free precession cine images were acquired in various orientations (short axis multi-plane, 4-chamber and 2-chamber long axis, right and LV outflow tract views in 2 planes) during repeated end-expiratory breath holds using a balanced turbo field echo sequence (voxel size 1.25 × 1.25 × 8 mm, reconstructed temporal resolution 30 frames/ cycle) to provide anatomical information for post-processing. Multi-plane short axis images were also used for planimetric analysis of stroke volume. 4D flow through the AV and mitral valve (MV) was measured with a retrospectively electrocardiography gated, velocity encoded phase-contrast sequence, during free breathing, without correction for breathing movement, without parallel imaging, with a field of view covering the basal volume, voxel size 3.5 × 3.5 × 3.5 mm, temporal resolution 30 frames/ cycle, velocity encoding 1.8 m/s, flip angle 10o, TR: 7.3 ms, TE: 3.9 ms . The scan time was 3.42 min at a heart rate of 75 bpm. Significant degree of AR was defined as more than 5% regurgitation fraction . Quantitative 2D flow across the AV was measured with a retrospectively electrocardiography gated, velocity encoded phase-contrast sequence during end-respiratory breath hold, voxel size 2.5 × 2.5 × 8 mm, temporal resolution 20 frames/ cycle, velocity encoding 2.5 ms, TR: 4.7 ms, TE 2.8 ms .
LV planimetric analysis was performed by manual tracing of endocardial contours on short axis images, using Qmass MR Research edition (version 7.4, Medis, Leiden, The Netherlands) to quantify LV end diastolic volume (LVEDV, corrected for body surface area (BSA)), end systolic volume (LVESV, corrected for BSA), mass and ejection fraction (LVEF). 4D velocity-encoded CMR data over the AV and MV were analysed using CMR 4D flow (version 2.0, Pie Medical Imaging, Maastricht, The Netherlands) with valve tracking, to quantify flow volume and degree of AR. MV flow assessment was used as internal validation of AV flow volume. For external validation of 4D flow volumes, 2D velocity-encoded CMR data over the AV were analysed using QFlow (version 5.6, Medis). Contours were manually traced in all phases of the 4D and 2D measurements. 4D AR was measured at peak velocity of the jet perpendicular to maximum flow velocity (Fig. 1). Feature tracking was performed using the 2D Cardiac Performance Analysis MR module of Imaging Arena (version 1.2, TomTec Imaging Systems GmbH, Unterschleissheim, Germany). LV GLS was determined from analysis of the four chamber CMR views, as an average of the six individual segments of the LV . Segments were excluded if non-capturing by the software was observed by eye-balling. If two or more LV segments showed non-capturing, the patient was excluded from analysis. All CMR analyses were performed by one researcher and subsequently re-analyzed by a second observer to test for inter-observer agreement. Both researchers had 4 years of experience with CMR imaging. Doppler transthoracic echocardiography was performed on a Toshiba Artida (Toshiba, Tokyo, Japan) with a 5-MHz transducer. Longitudinal strain analysis was performed with TomTec Image Suite (Version 6.0, TomTec Imaging Systems GmbH). After assessment of full view of all parts of LV myocardium for at least one cardiac cycle, a six-segment analysis was performed. Segments were excluded if eye-balling of the analysis confirmed non-capturing by the software. If two or more segments showed non-capturing, the patient was excluded from analysis. GLS was calculated as an average of the available segments. All echocardiography analyses were performed by one researcher (4 years of experience), and subsequently re-analyzed by a second observer to test for inter-observer agreement (12 years of experience). Normality of distribution was checked using the Shapiro Wilk test. Normally distributed continuous data were reported as mean ± standard deviation. Alternatively distributed data were expressed as median (interquartile range). For comparison of groups, independent samples t-test or ANOVA were used as appropriate. For agreement, the difference (between tests and within tests as inter- and intra-observer agreement, respectively) was first checked for significance through one-sample t-test. Agreement was then expressed as two-way, random-effects intra-class correlation (ICC) and checked visually through Bland-Altman plot. ICC was interpreted according to Koo and Li . The coefficient of variance (CoV) was defined as the standard deviation of the differences between the two measurements divided by the mean of these measurements. For all tests a p-value of < 0.05 was accepted as statistically significant. A total of 81 ASO patients participated in this study. All patients were clinically well and in NYHA class I. Patient characteristics are supplied in Table 1. Systolic LV function was normal as expressed by LVEF as measured by CMR and echocardiography (Table 2). LV dimensions expressed by CMR and echocardiography were also within limits of normal (Tables 2 and 3). 4D flow assessment of the AV demonstrated degree of AR of 4.1 ± 4.1% (Table 2), while 11 ASO patients (13.6%) had significant AR exceeding 5%. 2D flow showed comparable regurgitation at 3.2 ± 7.1% (p = 0.33), which agreed well with 4D flow (ICC = 0.85, CoV = 9.1%). In patients with significant AR, 4D flow had a tendency for a higher regurgitation fraction than 2D flow (8.6% ± 4.9% vs. 6.3 ± 7.2%, p = 0.09). When we dichotomized our ASO patients for 4D flow derived AR below or more than 5%, only indexed LVEDV differed significantly between groups (p = 0.014). For external validation of aortic 4D flow assessment, 4D flow derived stroke volume was compared to 2D flow derived stroke volume, demonstrating good agreement (ICC = 0.77, CoV = 11.0%, p = 0.20). The Bland-Altman plot is shown in Fig. 2. 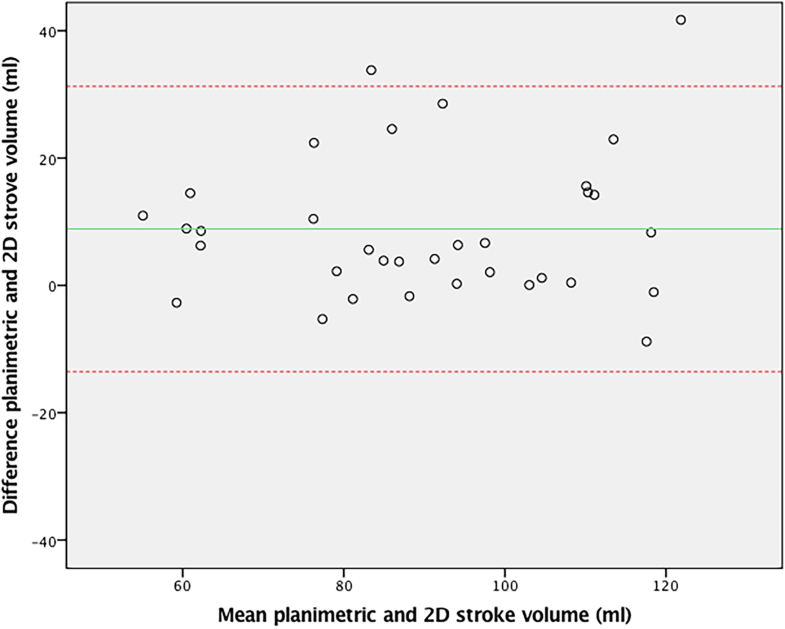 The outliers in this plot demonstrated good agreement between stroke volumes on 4D aortic, 4D mitral and planimetric measurements (within 5 ml of one another). 2D stroke volume mostly underestimated aortic flow compared to these other methods, despite good imaging quality of the 2D flow measurements in these patients. 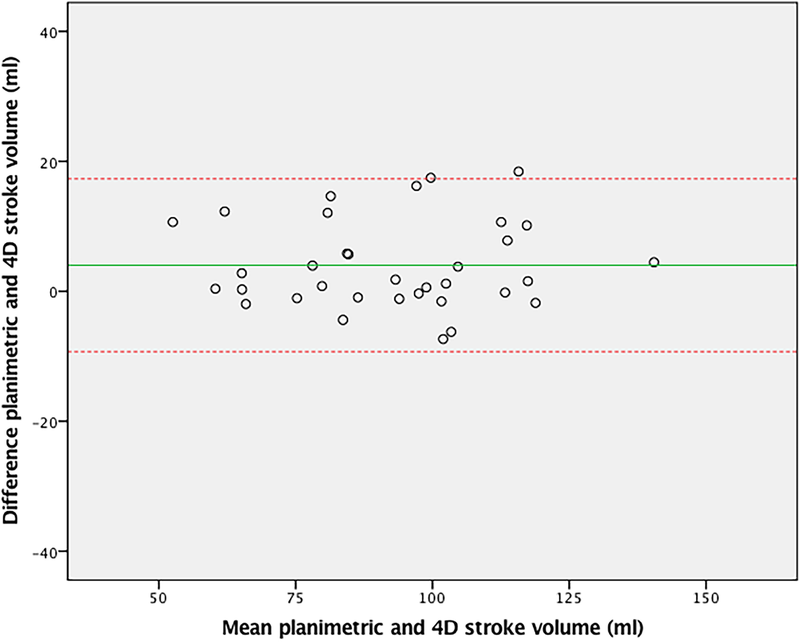 As a second external validation, 4D flow derived stroke volume was compared to planimetric stroke volume derived from the multi-plane short axis images. Agreement was also excellent (ICC = 0.95, CoV = 6.3%, p = 0.26) with the Bland-Altman plot in Fig. 3. 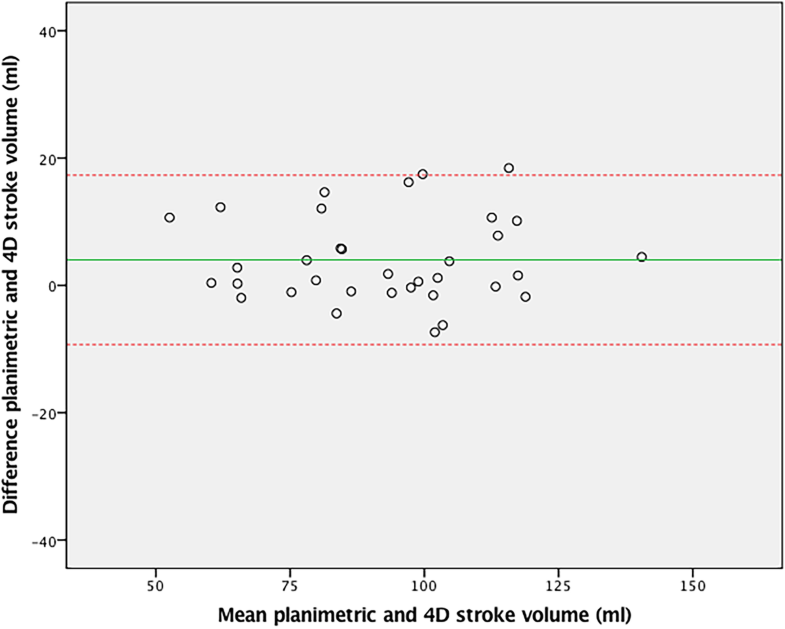 For internal validation of 4D flow, the 4D stroke volume across the MV (85.9 ± 25 ml) was compared to aortic 4D stroke volume, demonstrating excellent agreement (ICC = 0.94, CoV = 8.2%, p = 0.13) (Fig. 4). 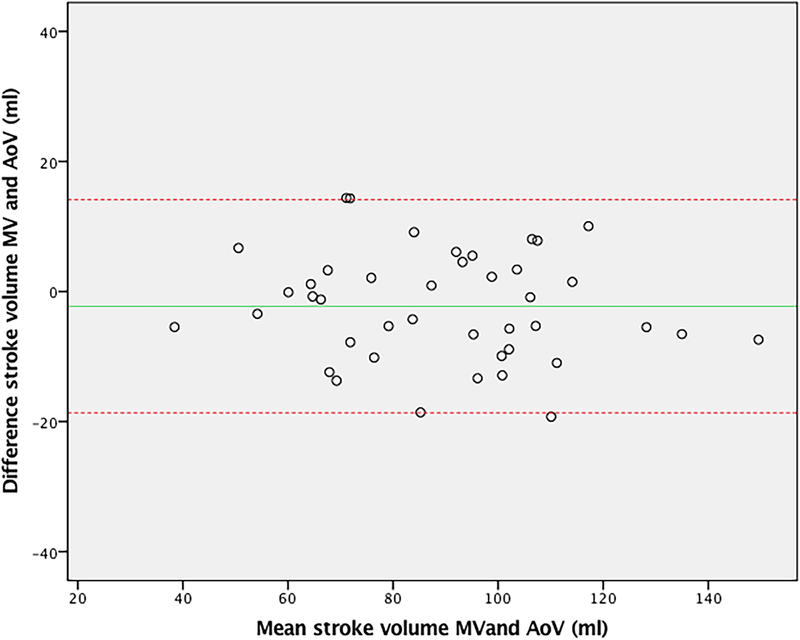 Inter-observer agreement was excellent for 4D flow stroke volume (ICC = 0.93, CoV = 4.8%, p = 0.32), similar to intra-observer agreement (ICC = 0.97, CoV = 2.3%, p = 0.58). 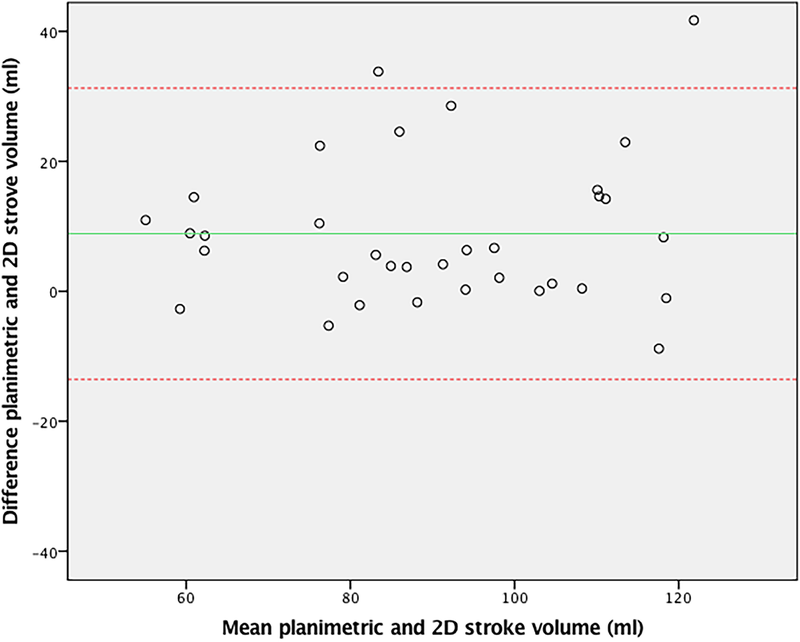 Compared to 4D flow, the agreement between aortic 2D flow stroke volume and planimetric stroke volume (ICC = 0.87, CoV = 12.7%) was slightly less (p = 0.18) (Fig. 5). To validate GLS by CMR feature tracking, a comparison was made to GLS by echocardiographic speckle tracking (Table 3). Agreement between CMR and echocardiography was good (ICC = 0.80, CoV = 9.6%, p = 0.67) as also shown in the Bland-Altman plot (Fig. 6). Inter-observer agreement for GLS assessment by feature tracking was excellent (ICC = 0.94, CoV = 4.2%, p = 0.70). Individual LV segmental analysis also showed good agreement between the different segments on feature tracking and speckle tracking (Table 4). CMR feature tracking is a reliable tool to quantify GLS and segmental LS in ASO patients. AR is a well-known complication mid- to long-term after ASO . Although only a minority of ASO patients suffer from significant AR, it may result in reintervention for up to 5% of patients . This AR after ASO is most likely related to aortic root dilation in combination with histological differences in neo-aortic root and valve compositions compared to the native aortic root tissue . Different studies have published conflicting results on the progression rate of AR in ASO patients. However, most recently published reports indicate a slow progression rate of AR over time [3, 19, 21, 22]. Our ASO patients with significant AR demonstrated increased indexed LVEDV when compared to ASO patients with AR less than 5%, as a reflection of increased volume load of the LV. Agreement between 4D and 2D flow CMR assessment of AR was good in our study. Stroke volume across the AV by 4D flow agreed better with MV flow assessment and planimetric short axis stroke volume measurements than 2D aortic flow, suggesting that 4D flow is a more reliable tool than 2D flow CMR for AV flow assessment. Our findings are in line with Roes et al. , who compared 4D flow and 2D flow volumes over the AV and the other intracardiac valves in both healthy volunteers and in patients with AR. 4D flow CMR showed excellent agreement over all intracardiac valves in both groups in their study. 2D flow in healthy subjects demonstrated only average correlation between valves in a study by Kilner et al. .
Interestingly, 4D flow gave slightly larger stroke volumes of the LV than 2D flow assessment in our study. In line with this, aortic flow was underestimated by 2D stroke volume in several study participants despite good imaging quality of the 2D flow measurements. In the same patients, all other stroke volume measurements showed good agreement with 4D stroke volume. We were unable to identify common denominators for the cases in which 2D analysis might have underestimated the stroke volume in ASO patients. Jarvis et al. validated 4D flow CMR for quantification of peak velocity across the AV in ASO patients . This study reported higher peak velocities with 4D flow compared to 2D flow CMR, which may explain why 2D flow CMR underestimates flow volumes. This is in agreement with the hypothesis postulated by Roes et al. that eccentric ejection and/or regurgitation jets – which are commonly present in ASO patients – are measured more accurately with 4D flow CMR than with 2D flow CMR . Since 2D flow CMR is measured in a fixed plane, correction for eccentricity of flow and adequate correction for through-plane motion of the aortic root during the cardiac cycle are not possible. With 4D flow CMR the measurement plane is adjusted throughout each phase of the cardiac cycle, as flow is recorded in three orthogonal imaging planes, thereby correcting for both flow eccentricity and through-plane motion of the aortic root [26, 27]. Given the excellent agreement between 4D flow CMR with planimetric flow volumes and the availability of semi-automated analysis of acquisitions with acceptable analysis time, 4D flow CMR appears to be ready for clinical use. Furthermore, despite the significant time expenditure for a 4D flow sequence acquisition (10 to 15 min scan time), the ability to scan both ventricles and great vessels with one sequence provides an important advantage over several individual 2D sequences. Global LV function is generally preserved in ASO patients [4, 28]. Despite this, concerns about long-term preservation of LV function remain, since the myocardial tissue in ASO patients has possibly suffered early damage related to perinatal cyanosis and cardioplegia. Also, altered aortic geometry may increase LV afterload . Impaired deformation expressed by GLS and torsion of the LV has been reported in ASO patients in studies by Pettersen et al. and Di Salvo et al., despite normal LVEF in these studies [6, 7]. GLS has been demonstrated to represent subclinical cardiac dysfunction when abnormal, and is an established precursor of overt ventricular systolic dysfunction . Furthermore, Grotenhuis et al. recently reported diffuse myocardial fibrosis of the LV in ASO patients by use of T1 relaxometry CMR. [Grotenhuis, Eur Heart J 2018] Overt LV failure has not been reported frequently, but follow-up beyond the third decennium after ASO is very limited. Whether the impaired deformation and global myocardial fibrosis will progress into LV failure, remains to be elucidated. Evaluation of systolic LV function should therefore include EF and GLS assessment, as part of long-term follow-up assessment in ASO patients. Although infrequently reported, segmental strain analysis could be used for detection of regional wall motion abnormalities related to prior complications from coronary artery reimplantation [31, 32]. 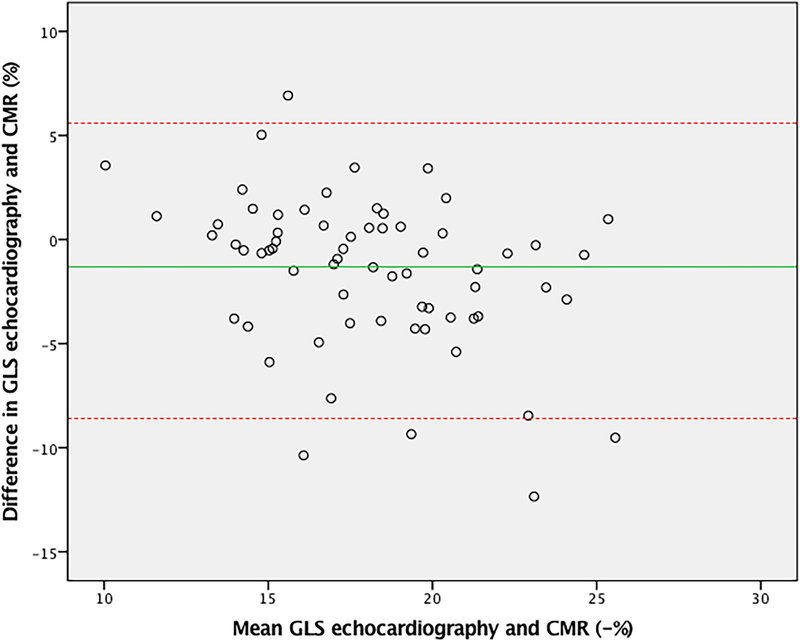 Our study shows good agreement between GLS assessed by CMR and echocardiography, as well as good agreement between the different LV segments, which implies that feature tracking is a valid alternative for speckle tracking. As the acoustic window for echocardiographic analysis can become limited during mid- to long-term follow-up of ASO patients [33, 34] GLS analysis by CMR provides a suitable alternative in this population. For maximum adherence to clinical practice, the 2D flow CMR data was acquired at 20 frames/ cycle, while 4D and cine images were acquired at 30 frames/ cycle. This may have resulted in lower peak velocity and lower stroke volumes. 2D flow was also acquired on breath hold, where 4D flow was performed with free breathing. Furthermore, for flow measurements as well as feature tracking, no golden standard was readily available. Therefore, we used consistency in net forward flow volume between consecutive valves as internal reference and multi-slice short-axis planimetric CMR flow volume as best available external reference. Feature tracking on 2D cine images, as used in this study, also has inherent limitations. The temporal resolution is lower than with echocardiography feature tracking and through-plane motion may cause inadequate tracking, both leading to an underestimation of peak deformation . This study demonstrates that 4D flow CMR is an accurate technique to assess degree of aortic regurgitation and that feature tracking is a reliable tool to quantify GLS in ASO patients. Comprehensive 4D flow and GLS analysis by CMR with semi-automatic analysis tools can therefore reliably be used for an integrated CMR analysis of AV competence and LV deformation analysis in ASO patients in a clinical setting. T. Leiner and B. Grotenhuis shared last authorship. Dr. Anne Marie Valente served as a JCMR Guest Editor for this manuscript. No grant or financial support was used for this research project. No author had any financial interest in the subject matter discussed in the submitted manuscript. SW participated in data analysis writing and editing of the manuscript. HG and HB participated in writing, providing perspective from the Pediatric Cardiology standpoint. MD, FM and PD participated in writing, providing perspective from the Cardiology standpoint. JW and TL participated in writing and editing of the manuscript, providing perspective from the Radiology standpoint. BD and EB participated in data analysis and writing. All authors read and approved the final manuscript. The medical ethics committee of Utrecht (METC UMC) approved this study. Al participants gave informed consent to participate in this study. Participants in this study gave consent to publish their data. Augustine D, Lewandowski AJ, Lazdam M, Rai A, Francis J, Myerson S, et al. Global and regional left ventricular myocardial deformation measures by magnetic resonance feature tracking in healthy volunteers: comparison with tagging and relevance of gender. J Cardiovasc Magn Reson. 2013;15(1). https://doi.org/10.1186/1532-429X-15-8. Schwartz ML, Gauvreau K, Del Nido P, Mayer JE, Colan SD. Long-term predictors of aortic root dilation and aortic regurgitation after arterial switch operation. Circulation. 2004;110(11 SUPPL). https://doi.org/10.1161/01.CIR.0000138392.68841.d3. Kempny A, Wustmann K, Borgia F, Dimopoulos K, Uebing A, Li W, et al. Outcome in adult patients after arterial switch operation for transposition of the great arteries. Int J Cardiol. 2012. https://doi.org/10.1016/j.ijcard.2012.06.066.